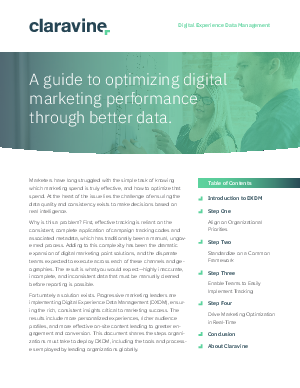 > Claravine > A guide to optimizing digital marketing performance through better data. Marketers have long struggled with the simple task of knowing which marketing spend is truly effective, and how to optimize that spend. At the heart of the issue lies the challenge of ensuring the data quality and consistency exists to make decisions based on real intelligence. The combination of manual campaign tracking, various marketing solutions, and disparate teams executing across multiple channels creates highly inaccurate and inconsistent data making reporting a difficult challenge. Fortunately a solution exists. This document shares the steps organizations must take to deploy Digital Experience Data Management (DXDM), including the tools and processes employed by leading organizations globally.